Railfuture Scotland plays its part in promoting Railfuture's campaign for better services over a bigger network, with a railway that is focussed on providing the best possible service and passenger experience. For an industry that often seems to do what is operationally easiest rather than what is best for its customers, Railfuture reminds all of Britain's train operators and Network Rail that every passenger matters. Although this website covers in detail some of the recent line and station reopenings in Scotland, along with infrastructure upgrades, such as electrification, it is vital that passengers have fast, frequent, convenient, reliable, safe, and value-for-money train services in which the journey experience is enjoyable and productive. Railfuture campaigns for all of these aspects, even small things such as sufficient ticket machines, toilets, and trains with Wi-Fi and power points. The little things matter. Railfuture across Britain, not just in Scotland, needs more members, especially women and young people, so if having a bigger and better railway that is value for money is what you want, please become a member - for just £18 (or £14 for concessions). Apply to join online now. In mid-November 2014 Railfuture Scotland published its proposals to expand Scotland's rail network - read our press release. Four years later these plans are unchanged. The Scottish media publicised Railfuture Scotland's proposals - see below. These proposals include a "top 50 list of stations to be opened or re-opened from Beattock to Culloden, with a further 45 to follow. This is quite realistic considering that about 70 stations have been added to the Scottish network over the past 30 years. New passenger and freight lines are also proposed. However, it's not all about new infrastructure. Railfuture Scotland is calling for faster and more frequent trains on existing routes, including more electrification, which should be speeded up. Passenger services on the re-built Borders Railway from Edinburgh to Tweedbank commenced on Sunday 6 September 2015, more than 46 years after the last trains ran on 6 January 1969, as described in details (with photos) HERE (also see the BBC report). The line, which is the longest domestic rail line in Britain constructed in more than a century, cost £353 million comprising £295 million (2012 prices) for construction plus almost £60 million for legal and land costs. A speeded-up video of the journey from the rear cab of the train can be watched on BBC web-site. 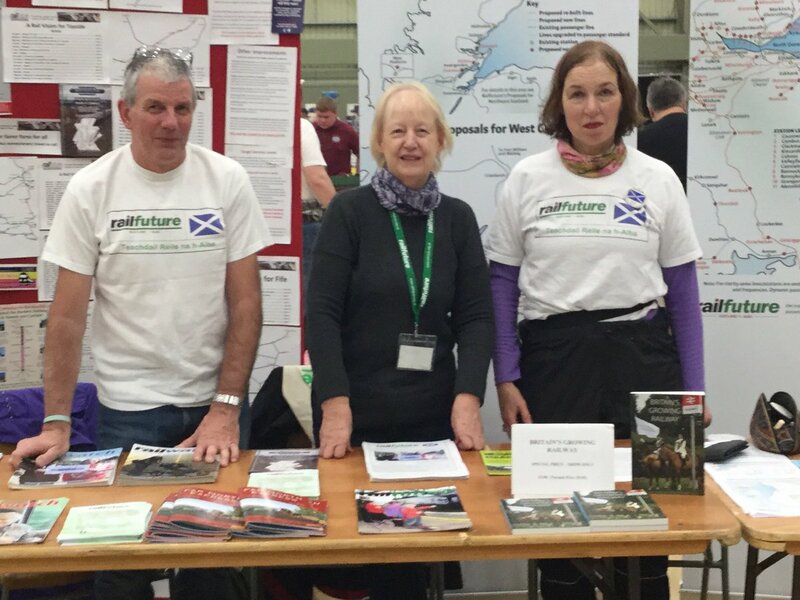 Railfuture Scotland has produced a leaflet about the Borders Railway reopening (published as a pull-out in Railwatch magazine issue 145) and also held a public event in the new Transport Interchange at Galashiels a few weeks after the reopening. In the first month since reopening there were 125,000 passengers, which is double the predicted monthly average, with some trains being overcrowded. At Galashiels station more people boarded a single train than predicted for the entire day. The latest published figures for the Borders Railway (6 September 2018) show more than 4 million passenger single journeys in the first three years of its reopening, with 1.5 milion in the third year alone. This compares to 1.3 million in the first year, which was almost 100,000 above the year 1 forecast in the business case that was produced in 2012. Initial teething troubles, such as late-running trains and an unacceptable number of cancelled trains because of train faults and limitations of the largely single-track route, affected patronage. Even so the reopened railway is a success story, and joins the success of the other lines in Scitland such as Larkhall to Milngavie, Airdrie to Bathgate and Stirling to Alloa. It also helps to make the case for other reopenings such as Levenmouth, which is one of Railfuture Scotland's key reopening campaigns. The economics of a rail service is determined not simply by the patronage but by the proportion of the time that seats are occupied. In fact the Borders Railway service has been much more economically viable than comparison against the business case would suggest. This is because, in just the first year of operation, the number of passengers at the Tweedbank terminus was 681% higher than predicted and the penultimate stop at Galashiels was 330% above prediction - a total of 550,000 passengers in the year versus the 90,000 estimated. Passenger numbers for stations closer to Edinburgh (where the journeys would have been much shorter) mainly fell short of predictions. If, as appears to be the case, the majority of the unpredicted journeys were along the full length of the line to/from Edinburgh Waverley station then the number of passenger kilometres - and therefore the revenue collected - is substantially higher than the estimates in the business case. Michael Matheson, Cabinet Secretary for Transport, Infrastructure and Connectivity, has described the Borders Railway as "a phenomenal success...bringing benefits to the local economy" with the line "acting as a catalyst for investment while opening up employment, leisure and education opportunities for communities along its length." Further evidence of the value of the new railway came from the Scottish Tourism Economic Assessment Monitor. It said that from January to June 2016 visitor days in the Scottish Borders were up by almost 11% compared to the same period in 2015, which was just before the railway reopened. The media has reported that Scottish Borders Council and Scotrail are considering improvements to the 'inadequate' facilities at Tweedbank station, which is the terminus, to cope with a much higher than expected number of passengers. A book entitled "WAVERLEY ROUTE: The life, death and rebirth of the Borders Railway" by David Spaven can be bought at a discount from the Railfuture Online Shop. He was one of the speakers at Railfuture's national conference in Newtongrange on 18th June 2016. On 1st April 2015 Scotland got two new train operators. Abellio took over the ScotRail franchise from First Group and a new Caledonian Sleeper franchise (run by Serco) commenced, operating the 'sleeper' services that were previously run as part of the ScotRail operation. Railfuture Scotland issued a press release on 9th October 2014, the day after Abellio was announced as the winner of the new ScotRail franchise after a bidding competition that lasted many months. Allison Cosgrove, Chair of Railfuture Scotland said: "Railfuture Scotland has enjoyed a good relationship with First during the current franchise, and First management have always been approachable and helpful. We appreciated the re-instatement of the Edinburgh-Dunbar local service which they instigated in 2010. However, having talked with all the bidders, Abellio were the most receptive to our ideas on new stations, and were the only bidder to ask us back for an in depth study of our 50 Stations proposals. We await with interest to see what is included in the optional additions to the franchise, and hope that they have adopted some of our suggestions. In recent years First introduced a small funding scheme for local groups with railway connections, and we hope that Abellio will continue to engage with local communities. We look forward to working with them." Alex Hynes, the Managing Director of the ScotRail Alliance, which puts him in charge of both the train operator, owned by Abellio, and the infrastructure operator, Network Rail, in Scotland, spoke to the Railfuture AGM in May 2018. He said that his intention, not just ambition, is to give Scotland the best railway it has ever had. ScotRail has started to introduce brand new eletric Class 385 trains manufactured by Hitachi. The 46 three-car and 24 four-car trains will operate along newly electrified lines on Edinburgh-Glasgow and, when electrification is complete, Stirling-Alloa-Dunblane. The has been a full refurbishment of the existing train fleet and passengers will soon be travelling on refurbised 'high speed trains' (HSTs) between Scotlands seven cities. It has a franchsoe committment to introduce a Scottish nationwide smart-card as an alternative to paper tickets, although Railfuture would like to see a single smart-card that works across Britain. Railfuture Scotland chaior Allison Cosgrove writes in October 2018: "I'm delighted to see wonderful coverage of Scottish railways in the current edition of Rail magazine. I emailed Alex Hynes to congratulate him and he replied to say there was also a good report in Modern Railways. He added 'Now we just have to deliver it!' Perhaps we should be more appreciative of what we have!" The Caledonian sleeper service has been operating as a standalone franchise since April 2015. It will see a €200m investment for 75 new coaches comprising four trains of 16 coaches (plus 11 spare coaches) operating the Highland and Lowland services. Railfuture Scotland sympathised with passengers whose journeys were disrupted for several weeks by the closure of the railway line between Linlithgow and Edinburgh Park. The closure, which had been known about for several years, was necessary to fit paved track (and renew drainage) in Winchburgh tunnel to create more clearance to carry overhead wires for the electrification of the line (something that Railfuture Scotland had campaigned for over many years). The work was soon completed and the line reopened in July. The significant, and unnecessary, disruption resulted in many people taking to the roads instead leading to more congestion. It could have been avoided if, as Railfuture suggested, the new Almond Chord (which is going ahead) was built in advance of the closure as had been originally proposed. However, in a deliberate decision by the Scottish Government it was postponed in 2012. Click here to see our flier about it. The electrification project, which is part of the £742m Edinburgh-Glasgow Improvement Programme (EGIP), will electrify 150km of track is progressing. The first wires were installed in October 2015 at which time 320 of the planned 2,366 stanchions had been erected. 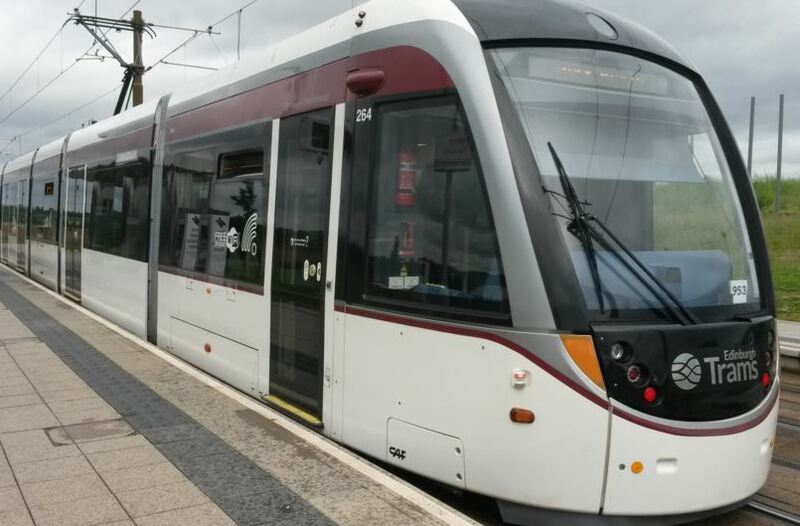 On 14 March 2019, after having updated the final business case, City of Edinburgh councillors gave approval (voting 36 to 26 in favour) to extend the Edinburgh tram network by 4.5km to Newhaven, Ocean Terminal or the foot of Leith Walk. The construction contract is expected to be signed in-mid 2019, with work commencing in late 2019 and the line between York Place and Newhaven due to become operational in 2023, and see a predicted total of 16 million journeys across the whole system. Click [http://www.edinburgh.gov.uk/tramstonewhaven/] for more information about the project. In the first year of tram operation, which commenced on 31 May 2014 (see BBC report), passenger number were 10% higher than forecast with three million people using them. During the first year of operation, as is expected with most businesses, the trams made a loss, which was less than 10 pence per journey. However, the above-expected patronage ensured that the and the trams soon started making a profit, generating a pre-tax operating profit of £252,000 in 2016 against a forecast pre-tax loss. The better-than-forecast patronage has continued: 4.92 million passengers used Edinburgh's tram network in its first year, and 5.38 in the second year, which is 6.7% greater than the target set before the opening. In July 2016 a new timetable was introduced with trams running every five minutes in the morning and evening peaks. Passenger journeys totalled 6.6 million in 2017 having increased by more than one million (19%), thanks to a new timetable launched at the beginning of 2017 to increase capacity, further improve frequency and reduce journey times. On 7 January 2019 figures were released showing more than 7.3 million journeys were recorded in 2018, which is an increase of 10 per cent on 2017. This was partily achieved by introducing "queue buster" services during morning and evening peaks, which sees trams running from every three minutes. The tram system continues to go from strenth to strength. In early October 2018 at the Global Light Rail Awards recognised Edinburgh Trams in all four of the categories it was shortlisted in. It won Operator of the Year (which it previously won in 2015 and 2017) and was highly commended for Environmental & Sustainability, Most Improved System and Technical Innovation infrastructure. Click [HERE] for more info by Railfuture Scotland. Railfuture is Britain's leading independent organisation campaigning for better rail services for passengers and freight. Railfuture is a voluntary group representing rail users, with 20,000 affiliated and individual members. It is not affiliated to or funded by train companies, political parties or trade unions. Every member gets one vote at its AGM. Railfuture campaigns for cheap and convenient rail services for everyone; better links for buses, bikes and pedestrians; policies to get more heavy lorries on to rail; new lines, stations and freight terminals - a better rail service and a bigger rail system for both passengers and freight. Our volunteer members in branches and around 300 local rail user groups across Britain campaign to get stations and lines reopened, and services and facilities improved, for the benefit of the community, economy and environment. Over the past 50 years we have played a major part in getting over 370 new and reopened stations and over 500 miles of route to join the network. Apply to join our campaign today - click Join Now using your credit/debit card via PayPal. Campaigns - Click [here] for a list of the main Railfuture Scotland campaigns. Campaign resources - Click [here] for a list Railfuture Scotland campaign resources. Newsletter - Click [here] to read back issues of 'Branch Notes' the Railfuture Scotland newsletter. Events - Click [here] for details of conferences and other events organised by Railfuture Scotland. Contacts - Click [here] for Railfuture Scotland contacts. Gallery - Click [here] for the Railfuture Scotland photo gallery. Links - Click [here] for links to external Scottish web-sites (including other campaign groups). Twitter - Click @RailfutureScot for the Railfuture Scotland twitter account. Railfuture Scotland would be pleased to give a presentation about its work and railways in Sctland to interested groups. On 4 April 2019 we gave a presentation (see slides) on the 'passenger experience' to Edinburgh-based Capital Rail Action Group, which like Railfuture campaigns for a better public transport, especially rail and light rail. Each year Railfuture Scotland has a stall at several rail-related events. The photo below, taken on 13th October 2018, shows three Railfuture volunteers, including chair Allison Cosgrove and secretary Jane-Ann Liston, meeting rail users and discussing our campaigns. it is also a chance to find out about how you can join us and take part in our campaigning. Railfuture engages with politicians from all political parties at Westminster and the devolved governments in Scotland and Wales. At the national AGM Railfuture members appoint Honorary Vice Presidents. These include rail professionals, specialist journalists and politicians amongst others. Railfuture has Vice Presidents from all major political parties. In Scotland one such person is Stewart Stevenson MSP. In early 2015 the Railfuture Scotland committee took him out for a meal and he then attended the committee meeting afterwards. The photo above (click it for a higher resolution image) shows (left to right) Allison Cosgrove, chair, Stewart Stevenson, Ron McLean, Lawrence Marshall, Jane Ann Liston, secretary, Anthony Lennon, Barrie Forrest, Roddy McDougall and Ken Sutherland. Stewart has extensive knowledge of the rail network and as well as being very informative and helpful to Railfuture. As well as organising the annual national conference for rail users and user groups, Railfuture works at local and national level with train operators and other stakeholders to secure a better railway. Railfuture makes awards to campaigners from its Fighting Fund to bring about improvements. Awards have been given, for example, for publicity initiatives and feasibility studies. If you would like to join our campaign for a rail future please go to the Join Us page to apply for membership. It is just £18 (concessions available) which provides four all-colour magazines a year plus more. If you have any questions or comments about the work of Railfuture Scotland you can contact piur secretary (see contacts page). This website is hosted by TSO Host and maintained on Railfuture Scotland's behalf by Billing Specialists Ltd.